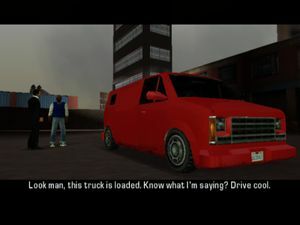 Bringing the House Down is a mission in Grand Theft Auto: Liberty City Stories given to protagonist Toni Cipriani by explosives expert 8-Ball from his explosives shop in Pike Creek, Shoreside Vale, Liberty City. Toni returns to 8-Ball who has all the explosives ready. Donald Love phones 8-Ball and informs Toni that the weakest points under Fort Staunton is the new Porter Tunnel development and the old subway tunnels. Toni leaves, carefully driving the van full of explosives to Fort Staunton. On the way, he is attacked by Forelli Family mobsters but manages to escape. He then enters the Porter Tunnel and drives to various parts of the Tunnel and subway tunnels, planting the explosives. Toni then leaves the tunnels, killing any construction workers who are witnesses. He escapes in a vehicle, just as the explosives detonate, destroying Fort Staunton. 8-Ball: Look man, this truck is loaded. Know what I'm saying? Drive cool. 8-Ball: Yeah? It's all good. Sure. I'll put him on. Donald Love: Toni, we're one little job away from being fabulously rich. We've scoured plans of Fort Staunton. Its weakest points are along the old subway that runs underneath the area. Toni Cipriani: Great Don! All I gotta do is dodge a hundred wacko Italians. Donald Love: Just head along the Porter Tunnel and you'll find your way in just fine. Toni Cipriani: The Forellis? What are they doing here? Worker #1: Get the hell out of here! Worker #2: Hey! You're not supposed to be down here! The reward for completing the mission is $5,000 and the Love on the Run mission is unlocked. Not placing the first explosive does not start the time limit, so the player has the opportunity to explore the abandoned subway. The name of this mission is a reference to the film Bringing Down The House starring Queen Latifah. The two train wrecks are likely remodeled versions of the operational trains in the game. The wrecks will not change color even with cheats activated. Four glitches occur before and after the mission where part of the subway (including a train wreck, a roof support, and part of the train track) can be seen. In an LCFR news report it is stated that the Forelli Family were seen entering the subway, suggesting they have been blamed for the explosion. The first subway tunnel you enter is actually a remodeled version of the operational tunnel in the game, as both are of the same shape and have the same roof supports. However, the abandoned tunnel has a few differences, one of them being the junction. Donald Love telling Toni Cipriani that the weakest points of Fort Staunton are the old subway tunnels. Toni Cipriani about to enter the van loaded with explosives. Toni Cipriani about to drive the van into the Porter Tunnel from Shoreside Vale. Toni Cipriani driving in the Porter Tunnel after escaping a Forelli Family attack. Toni Cipriani running over workers in the hole dug into the abandoned subway. Toni Cipriani planting the first of the explosives. Toni Cipriani driving further into the abandoned subway. Toni Cipriani being confronted by a worker in the abandoned subway shortly after planting the second explosives at the second station. Toni Cipriani planting the final explosives - in the bottom right, a disused train can be seen. Toni Cipriani using a car to break down a chain-link fence to the escape tunnel at the second station. Toni Cipriani, inside the car, driving through the escape tunnel to avoid the explosion. The entrance to the abandoned subway station being blown up. The Ristorante ecoli restaurant and two diners being blown-up. The Bo-Bella Boutique being blown-up. This page was last modified on 8 May 2015, at 23:54.